Apex Legends has just begun its first season of competitive battle royale, introducing new character - Apex Legends Octane - into its gauntlet of squad-based multiplayer, alongside a host of other items, cosmetics, and updates. Some players have expressed disappointment at the lack of challenges and metagame content available in the first season's battle pass, but Respawn has already come out and promised that this lack of ambition is merely for the studio to test the waters before really coming out swinging. Indeed a new asset hiding away in the game's files, recently uncovered by dataminers, suggests grand things are still in store for Apex Legends, and they come in the form of big, scaly, fire-breathing beasties. That's right; start practicing your High Valyrian, because we're talking dragons. In the latest update to Apex Legends, dataminers have just found a recently added game file entitled "FlyerSwarm", while a leaked screenshot (seen below), shows exactly what this Swarm might look like in the game itself. I don't know about you, but that looks a lot like a herd of mini dragons to me. The world of Titanfall 2, in which Apex Legends is set, does feature winged creatures known as Flyers. More curiously, these Flyers can already be seen hovering across the skys of the Apex Legends map whenever you look up, but could Respawn be about to integrate them into the gameplay itself? Whether that comes in the form of a new character ultimate ability, or a throwable grenade which attracts Flyers towards anyone caught within its area of effect, is anyone's guess. It's also worth remembering that Respawn has already stated that a lot of datamining from Apex Legends has little accuracy when it comes to predicting the game's future, as the studio often spitballs with ideas before throwing them out with the bathwater, so to speak. 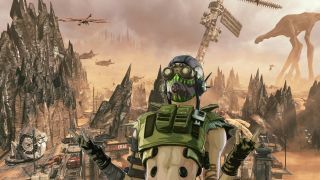 Nevertheless, the idea of fighting or exploiting a "FlyerSwarm" of Titanfall's dragons in Apex Legends sounds nifty, not to mention a good way to keep players coming back for in this crucial first season of competitive battle royale for the game. We'll keep you updated if we hear anything more. In the meantime, check out every item and cosmetic that's included with the first Apex Legends battle pass in the video below.